Create a casual, home-like work area for classroom students, or in commons and reception areas in any environment. 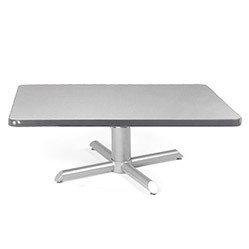 Low square coffee tables have a 1-1/2" thick top, 3/8" bumper T-mold edge and 18 gauge steel tube and cast iron base. Models with power modules available to provide students and staff with a handy charging station.